Causeway Cottages, County Antrim, circa 1888. In many areas of Ireland New Year’s Day is overshadowed by the traditional observances and festivities that accompany the Twelve Days of Christmas, which run from Christmas Eve to the Feast of the Epiphany, 6 January. 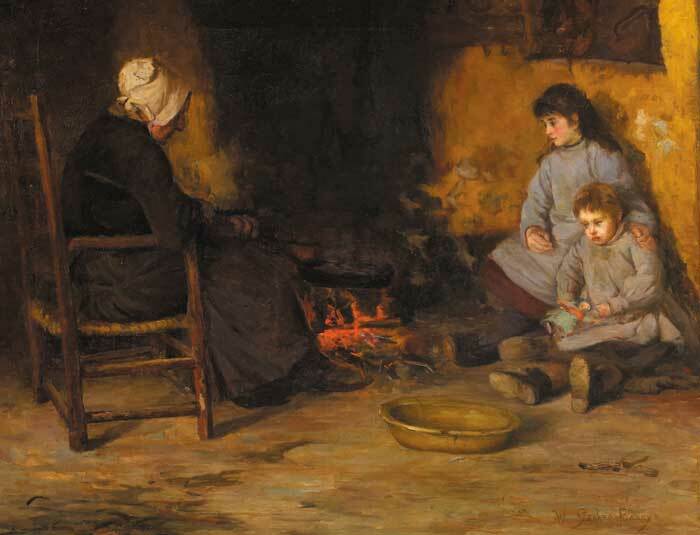 In many Irish Protestant communities New Year’s Day was traditionally believed to mark the end of the Christmas season, and was often referred to in nineteenth century sources as ‘Little Christmas’ – one of the many names applied to the Feast of the Epiphany, 6 January, which marked the end of the Christmas season in Catholic households. The custom of lighting candles or rush-lights in honour of the Twelve Apostles is traditionally carried out by families on Twelfth Night, which is observed on the fifth or sixth of January. * The number of candles used in this ritual varied between one district and another, with some areas lighting twelve candles to represent the Twelve Apostles, while in other areas a thirteenth candle, usually larger and generally placed in the centre of the original twelve, was added to represent Jesus. Whilst the candles melted prayers and decades of the rosary were recited by those present. Traditionally each member of the family lit one candle, the flame of which was said to signify that person’s longevity. In this way the first candle to burn out was supposed to indicate the member of the household who was destined to be the first to die. In the old days, when candlesticks were scarce, candles were stabilised in a bed of ashes, cow-dung, mud, or even graveyard clay, while sieves of oats were used, for the same purpose, at least in County Westmeath at the end of the seventeenth century. Once the candles had consumed themselves a ball would be made of what remained, if the candles were supported using cow-dung the ball was placed above the door of the cow-house to encourage an increase in the herd of cattle for the coming year, while if the ball was made of mud or clay it was often placed above the main entrance of the home, where it was believed to protect the inhabitants till the next Twelfth Night. *In Ireland, and indeed internationally, there is some contention as to when Twelfth Night falls, with some observing Twelfth Night traditions on the eve of the Feast of the Epiphany, 5 January, while for others the Feast of the Epiphany, 6 January is believed to be the proper date. Duncan, Leland L. ‘Further Notes from County Leitrim.’ Folklore 5, no. 3 (1894), pp. 177-211. Wilde, Lady Jane, Irish Cures, Mystic Charms & Superstitions, London 1890. ‘In the south and west of Ireland marriages amongst the peasantry, with rare exceptions, take place during Shrove-tide. * Many of the people think it would not be lucky to be married at any other time of the year; consequently the priest always, when it was possible, visited the island during Shrove for the purpose of solemnizing any weddings which had been arranged. It, however, sometimes happened that the weather was so stormy for weeks together that no boat could approach the island, so it had been arranged that, when this occurred, the engaged couples should at an appointed hour assemble on the east shore of the island, while the priest, standing on the shore of the mainland opposite to them, read the marriage ceremony across the water. As soon as the storm abated he went to the island and did whatever more was necessary to render the marriages valid in the eye of the law and of the Church. *Traditionally the period between Christmas and Shrove Tuesday was known as Shrove-tide throughout Ireland. Generally it was the most popular time to get married, as the Catholic Church refused to sanctify marriages during Lent and Advent, both of which were times of abstinence and devotion, while at other seasons the people were generally too busy with farm-work or fishing to contemplate marriage. Incidentally William Le Fanu was the bother of the Irish Gothic writer Sheridan Le Fanu. ‘The eight of December is a Catholic holiday. Since nineteen hundred and twenty-two, my career as a young gangster touched the high spot, fused and went out. ‘Will ye come out with the Mummers?’ a fellow asked me. ‘I wouldn’t think twice of it if I knew the rhymes,’ I said. There were about fifteen lads in our troupe of Mummers. I had an insignificant role at the tail of the play. I wore an old black bowler hat and a cardboard false face. We headed across, jumping drains and scrambling over hedges. We were well received by the people, hardly any house barred its door against us. We carried a melodeon though none of us could play the instrument. 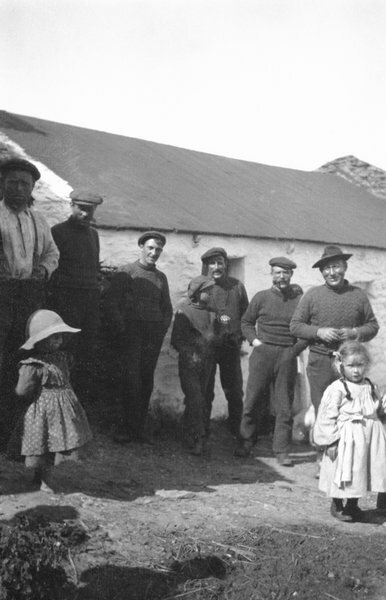 The old folk in the little houses gave us a warm welcome: they looked upon the Mummers as an old Irish custom, which it was not. The big houses looked upon us as hooligans and it might be they were right. During our travels a bottle of poteen made its appearance. One of our characters, Oliver Cromwell, had the bottle on his head….. In one big house to which we forced our way we were met by silence. A side of bacon hanging from the rafters dangled above our heads. One of our fellows snatched the bacon from its hook and we all ran out. We went up to a house in a bog village known as Sooty Row. The door was slammed in our faces The ‘Doctor’, part of our cast, carried a huge wooden beetle which he had taken from a tub of pigs’-mash in one of the houses. Bang! Bang! Crash! He struck the closed doors and smashed them to smithereens. Then we all ran. In another house we got eighteen pence and a warm welcome. That should have satisfied us but it did not. A pile of griddle-cakes stood on the table near the door, one on top of the other. The bottom cake was a lovely fruit cake with cherries and raisins sticking out its sides. As I went out the door I heard a noise and a commotion. I looked around and saw five or six cakes – like the wheels of turf-barrows – rolling about the floor: the fruit cake wasn’t among them. One of our number dashed past me hugging that cake. The man of the house stood in the doorway and we heard him say, very politely: ‘A meaner lot of young men I have never known.’ The cake was devoured in a minute. I got very little, just a crust from which the donor had carefully picked the raisins and cherries. By the roadside we sat down to count the money. There was a row. We split: it was more or less a political split. The Free Staters turned for home, the Republicans continued ahead. There was a dance in a near-by hall. I didn’t want to go as I was fagged out. Despite having spent all of her short life in Egypt Saint Catherine Alexandria was, at one time, among the most revered saints in Ireland. The many religious institutions named after Saint Catherine give some indication of the saint’s widespread veneration in Ireland over previous centuries, but it is perhaps Saint Catherine’s Bed, one of six penitential beds, at Lough Derg that gives the greatest indication of the high position she previously held among the saints of Ireland. As Saint Catherine is considered, at least in Ireland, to be the patron saint of seafaring* it is natural that her cult has remained strongest in places like the coastal parishes of Killybegs in Donegal and Ventry in Kerry, both of which have Catherine as their patron saint. Saint Catherine’s Feast Day, 25 November, has continued to be observed in Killybegs and Ventry with pilgrimages and patrons at holy wells which, according to legend , were long ago blessed in Saint Catherine’s honour by survivors of shipwrecks, often monks, who believed the saint had intervened to spare them being drowned. In Killybegs there is also a more recent legend, dating from the middle of the nineteenth century, in which a Protestant rector named Lodge decided to fill the holy well with soil, in an effort to put a stop to the well worship in the area, only to discover that after doing so a spring shot up through the floor-board of his house flooding his drawing room, leading the rector to have the holy well restored to its previous state. * Internationally and in the Roman Catholic tradition Saint Catherine of Alexandria is considered to be the patron saint of many occupations including unmarried women, millers and archivists, however to the best of my knowledge, seafaring is only ascribed to her in the Irish tradition. The Goose Girl – Edith Sommerville, 1888. Crawford Gallery, Cork. The tradition of sacrificing a fowl or a farm animal on Saint Martin Eve was once widespread in Ireland, and was still strong in many parts of the country into our grandparents’ times. The type of animal slaughtered depended on the means of the household; in wealthier households a pig, lamb, calf, or other animal was generally chosen, while in the majority of households, especially as the nineteenth century progressed, the slaughter of a fowl, generally a goose, chicken, or duck became the most widespread offering to the saint. Once the creature was slaughtered, to protect the household from evil and to encourage prosperity in the coming year, the blood was spilled and sprinkled over the threshold, about the windows, and in each corner of the dwelling, in some cases, the byre, stables and other outbuilding were protected in a similar manner. On Saint Martin’s Eve the spilling of blood was considered so essential that, in cases where a household could not procure an animal a member of the family would spill some of their own blood, by cutting the finger, to maintain the custom and ensure the household’s safety. The slaughtered foul or beast was eaten on Saint Martin’s Day which along with Michaelmas and Christmas day were the only holy days when the consumption of meat was permitted. Wilde, Lady Jane. Ancient Legends, Mystic Charms and Superstitions of Ireland. London, 1888.